Toyota has announced that the new Prius marks further advances in the driving capability and appeal of the world’s most popular self-charging hybrid car. Ever since the European launch of the original model in Brussels in 1997, the Prius has been a leader in technical innovation, making ever-greater progress in efficiency, refinement and driving pleasure through four generations. It has been a consistent pathfinder for advanced, useful new technologies. The 2019 Prius was launched at the Los Angeles Auto Show and made its first European appearance at the Brussels Motor Show in January 2019. 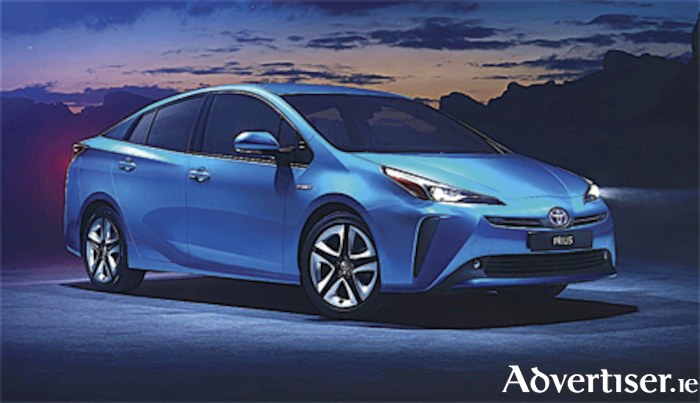 The Prius will be available in Ireland next month and prices start from €32,250, with the Prius ‘Luxury’ at €34,950. These prices include a reduction of VRT of €1,500, and dealer delivery and related charges are extra. Toyota reminds us that the current Prius has already taken the driving experience to a higher level with its first use of the Toyota New Global Architecture (TNGA ) GA-C platform, securing unprecedented dynamic performance and ride comfort with a lower centre of gravity and significantly increased body rigidity. The latest evolution of Prius’ styling gives the car a cleaner look. Sharp, slim new headlight units emphasise a sweeping horizontal line that evokes a wide and planted stance and feature new bi-beam LEDs that give a wider field of illumination. The flowing line down the sides of the car, producing a more dynamic, flowing silhouette. At the rear, new combination lamps again focus the eye on a strong horizontal line to emphasise the car’s low centre of gravity and are fitted with new-design light guides. The powerful effect is heightened by a new inverted trapezoid shape integrated in the tailgate around the licence plate. Two new colours, Pearl Red and Aqua Breeze have been added and a new 17-inch alloy wheel design and a new contrast dark grey finish for the 15-inch wheelcaps. In the cabin Toyota points to the sensory quality, which it says has been enhanced with small but telling changes to the centre console arrangement and some of the controls on the instrument panel. New cloth upholstery finishes have been introduced, adding to the overall smarter and more refined interior, while changes to the equipment specifications include an increase in size for the wireless charging tray to accommodate larger smartphones and a multimedia Toyota Touch 2 touchscreen that offers faster response and can be operated using ‘pinch and flick’ gestures familiar from smartphone use.